There's something to be said about a person's choice of fragrance, and the way it changes as you grow and change. What your scent SAYS about you, or what you want it to say about you. And whether or not you even LIKE the scent you wear, or if you wear it to literally EXUDE a personhood that you don't fit but desperately wish you did. Kat Von D's Saint and Sinner perfumes remind me of this real dilemma that I feel around fragrances and perception, particularly because of the cult-like status surrounding them. Read on to find out why. When I think back, I believe the first time I really thought about the importance of fragrance was when Gap Perfume was literally the be-all, end-all of the middle school girl's wish-list. I remember accompanying my friends to the mall to ooh and ahh over Dream, Heaven, OM and Day (nobody oohs over Grass or Earth) and assigning the fragrances to each other the way we would assign Sailor Scouts or Spice Girls. I feel like I always wanted to be cool like the girls who effortlessly sported Dream or Heaven, but I knew I was always a 'Day' instead. Funny thing though? Iactually can't even remember which one I OWNED because it was a hand-me-down which kind of defeats the purpose of actually purchasing one on your own. Move on to high school and I believe the first fragrances I actually got to choose on my own were Tommy Girl (because every teen in the 90s had it) and [http://www.mimifroufrou.com/scentedsalamander/2011/12/smelling_tommy_girl_now_scente.html], and Clinique Happy. The latter of which is still a fairly popular, and of which I also own Happy In Bloom now for the occasional wear as well. As you compare the top & main notes from all these selections, I was super infatuated with fresh, citrus scents. Something young, and youthful, or at least what I determined was youthful. The first perfume I owned that kicked that contrivance to the curb was the ever popular Vera Wang Princess, which is definitely more romantic and alluring, but still a relatively young fragrance. It wasn't until my late twenties that my nose embraced classics likes Chloe, or recent hits like Marc Jacobs Daisy and Decadence. I still have a soft spot for bright, citrus perfumes but my mood is often woodsier perfumes with white florals or musk these days. 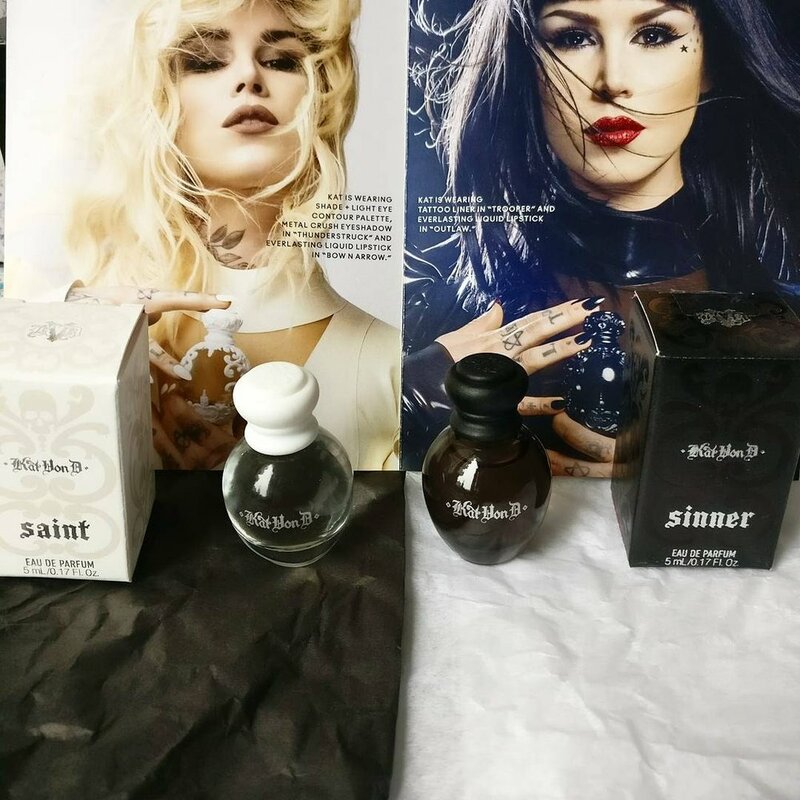 When I first heard of Kat Von D's Saint and Sinner perfumes, it was in hushed tones by the few lucky people who still owned bottles. Definitely a collector's item for those obsessed with her brand. I was curious to try them for myself, as I could easily believe Sinner to be a dark beauty, but more curious to see how Saint would stack up as well. Without even smelling Saint, I had a feeling it would be a delicate vanilla scent with a hint of a powdery finish, and I have to say it literally smells almost exactly as I envisioned. It doesn't play around with anything too complex, and is a soft, feminine fragrance that I would almost describe as elegant, if the vanilla notes were toned down a bit. There is a hint of jasmine and peach, and others have noted clary sage, although I often have a hard time distinguishing that myself, but the jasmine shines through nicely. As a person who often falls back on white floral scents, it's SLIGHTLY different from your standard romantic fragrance, and I envision this perfume as being something to spray before a brunch, or in the morning to set your mood. But don't rely on this for all-day fragrance as I found it doesn't last very long, and the sillage is pretty light. I tested this a few times and found that Saint faded quite a bit after about three hours and was completely gone after six. On the flip-side, I wasn't sure exactly what I was expecting with Sinner. Was it going to be overly aggressive? Masculine in scent? But no, it's a spicy, warm, almost earthy scent, enhanced with a bit of cinnamon and vetiver. (My boyfriend almost exclusively wears a vetiver cologne so that stood out to me in this fragrance.) It is a heady perfume that brings up all kinds of warm late-fall and winter imagery, crushed velvet and darkened rooms. It's definitely the sexier of the two fragrances by far. But once again, this perfume doesn't have a lot of staying power and while I found the sillage was slightly wider, the longevity was similar to Saint, which is a pity in such an interesting fragrance. These products were provided for review by Influenster and Kat Von D Beauty, but all opinions are my own.